In silico et in situ takes the art out of the gallery and into the environment by creating site-specific art installations through the use of 3D scanning and printing technology. These sculptural interventions are created by using source materials or inspirations from the natural (Bath, Oh: fauna habitats) or urban environment (Vienna, Austria: 3D printed fragments of interest). After manipulating the source material virtually (in silico) with 3D software, the sculptures are physically manifested through the use 3D printing in a variety of materials and then placed back into either nature or the urban environment (in situ), where the source material was harvested (3D scanned) or inspired from. As the pieces become publicly accessible they allow for a playful discovery of the work. The land and urban scape is then intricately linked with the artwork, converging in the creation of a contemporary techno-voxel sculptures. The work reflects on the theme of discovery, art, fragments and artifact, and comments on our current state of technology and its impact on society and nature. In Summer of 2017 the first 3 prototypes created were an a turtle basking platform an LED Spider ring habitat and a pollinator watering station. All 3 prototypes were digitally designed and produced on a 3D printer and all three were used by the intended animals. It has proven to be a tremendous learning experience to showcase the interplay of the digital with the habitat design, to not only inspire future interest in biology, but also in new forms of digital design and fabrication. 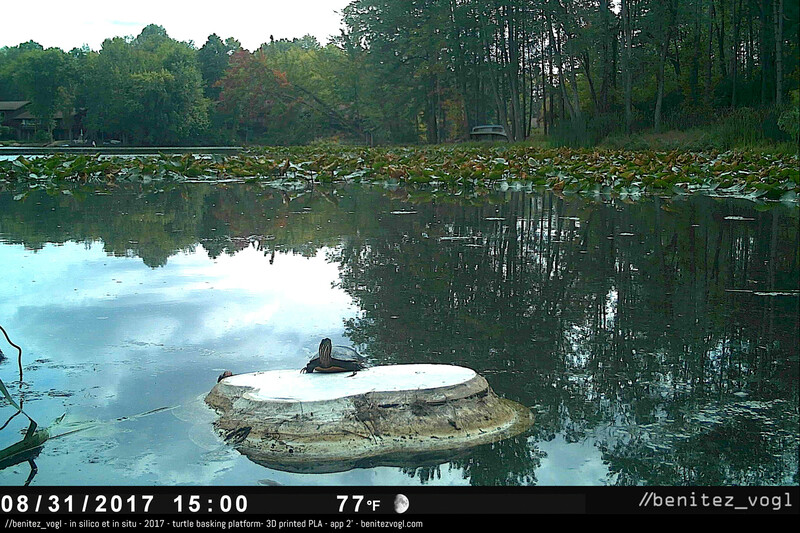 This particular iteration is specifically designed for the use of turtles and the videos and photographs stem from the installation of the platforms in Summer 2017 at Bath Nature Preserve in Bath, OH. 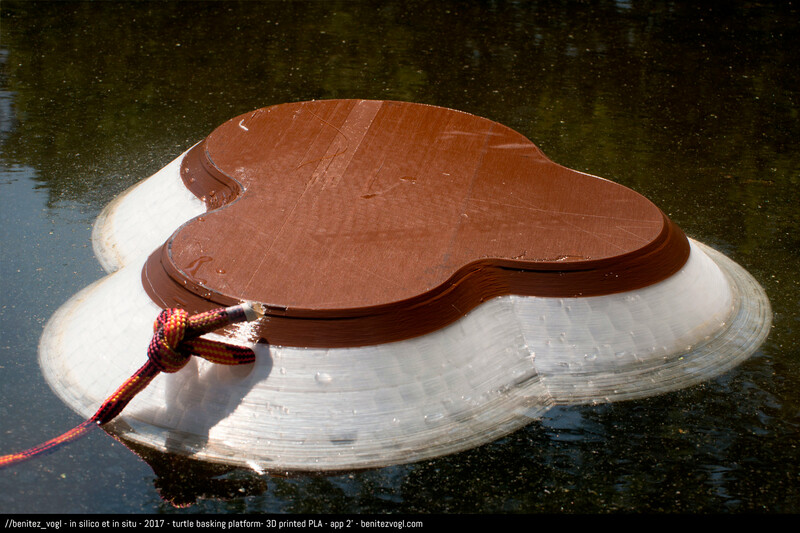 The photo shows common painted turtles sunning on our 3D printed floating turtle platforms. 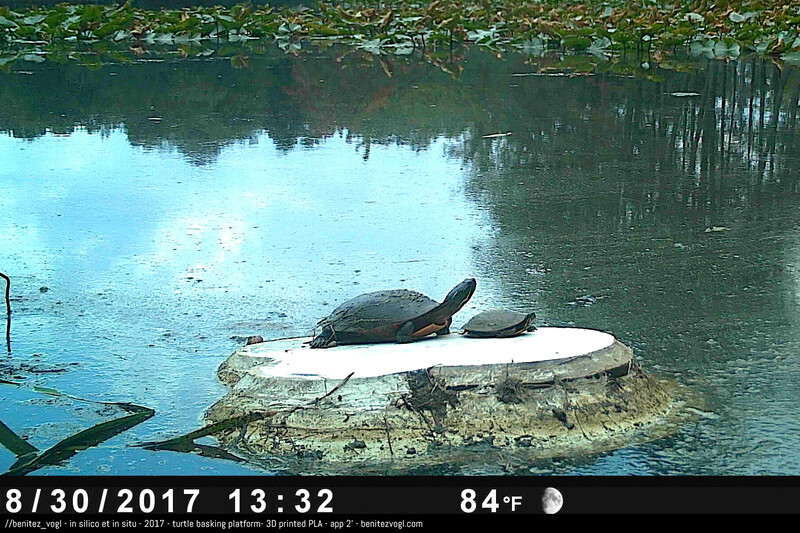 As of the moment we have been able to count three turtles at one time using our platform. The turtles are very skittish and can only be photographed or video taped with trail cameras. It has proven to be a tremendous learning experience to showcase the interplay of the digital with the habitat design, to not only inspire future interest in biology, art and design but also in new forms of sculpture and digital fabrication.The ultimate goal for these platforms (combined with the use of trail cameras) is to help document and confirm turtle populations and species. Currently several more platforms are ready for deployment in 2018.